Prof. Julian LeGrand wrote a short, enlightening book we wish we'd written, though perhaps not with his rather dry title of Motivation, Agency, and Public Policy. In contriving any system of government, and fixing the several checks and controls of the constitution, every man ought to be supposed to be a knave and to have no other end, in all his actions, than private interest. By this interest, we must govern him and, by means of it, notwithstanding his insatiable avarice and ambition, co-operate to the public good." - David Hume, "On the Independency of Parliament"
David Hume echoed Confucius' observation that everyone involved in government is greedy and that it's difficult to ensure that what government employees do benefits the public interest. Adam Smith's observation about the problem of harnessing a businessman's greed to the public good is much better known. Everybody knows that businessmen are greedy. Liberals harp on the idea that government is needed to protect us from greedy businessmen, whereas the truth is that customers stop buying from businesses that treat them badly. Businesses that are too greedy go under, but it's difficult to limit greedy politicians or greedy government employees. Politicians plainly work for themselves, not for us. Government employees seem far more interested in feathering their nests than in looking out for the public. We see false claims of illness, political pressure, recall campaigns, and complaints without number whenever public employee pay, pensions, or health care are discussed. The core idea behind the book was a change in the perception of government employees by elected officials and the public. In most Western societies, government not only funds public activities such as education, street repair, and health care, but government employees provide the services. In the 1980's and 1990's however, many countries changed the rules. Government retained control of financing public services, but hired private organizations to provide them - outsourcing the work to privately owned and operated contractors. These reforms were controversial to say the least; public employees whose jobs left the government sector protested with great force. The government's stated objective was to save money, but the real reason, Prof. LeGrand argues, was a shift in perception of government employees. From the end of WW II until the late 1970's, government employees were regarded as more knightly than knavish. That is, most people believed that most government employees genuinely sought to serve the public good instead of serving themselves. Old childrens' books reflect this point of view. Society's positive attitude towards "public servants" grew out of the shared sacrifice and common purpose of WW II. The British nation came close to extinction and was saved by the selfless efforts of British citizens and officials at all levels. This sense of "pulling together," which animated the creation of the British welfare state, became frayed as taxpayers saw government employees go on strike to protect levels of pay and benefits which taxpayers found outrageous. The British followed their leaders without question throughout the war. When the welfare state was set up, it was decided that government employees would determine precisely which services any citizen would receive just as they'd done during the war. Patients would follow doctors' orders, students would go to schools and classrooms selected by the education bureaucracy, and so on. Instead of being treated like queens who can go wherever they like on the chessboard, recipients would be pawns, passively receiving whatever their betters decided they should get. 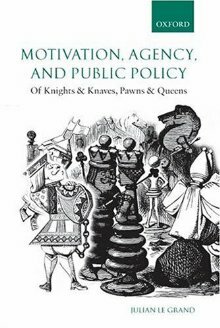 During the decades since the war, perception of government employees changed from regarding them as knights to thinking of them as self-serving knaves. At the same time, people who received government services demanded more choice. Politicians and civil servants who invented the welfare state and worked within it to manage and guide it. Taxpayers who funded the programs. Citizens - or more accurately, subjects - who receive benefits such as welfare checks or education for their children. The politicians who designed the National Health Service and the welfare system assumed that civil service workers such as teachers and doctors would selflessly try to advance the public good, that taxpayers would feel that the societal benefits of the taxes they paid were worth the money, that recipients would do as they were told, and that everyone would be responsible enough not to ask for benefits except when necessary. In other words, the British welfare state was set up to be operated by selfless knights to serve pawns who did what they were told without question and wouldn't ask for more. As anyone with the slightest acquaintance with human nature could have predicted, there were problems from day one. Instead of being grateful, public housing residents complained and damaged property. Throughout the first 50 years of the welfare state, there was constant development of checks and balances to control people who were work-shy, destructive, disruptive, loafers, or scroungers. There was constant tension between the notion that welfare recipients were passive pawns and the observation that many were active knaves who abused the system to maximize their benefits. People got tired of waiting in line for medical services. As the consensus regarding public education broke down, parents put children in private schools. Taxpayers became disgusted by endless tax increases. When Margaret Thatcher was elected Prime Minister in 1979, her government viewed civil servants with suspicion that they were far more likely to be knaves than knights. When providing services in the health care system, they abused their monopoly power. Patients who were dissatisfied had nowhere else to go and could be treated as passive pawns with impunity. Instead of being designed so that knightly government employees delivered services to passive pawns, Mrs. Thatcher's colleagues decided, the systems should be changed so that knavish government employees had no choice except to deliver the services that newly-empowered customers wanted. They decided to apply market forces to the provision of government services. Prof. LeGrand's formulation explains a great deal about attitudes toward any government program. Anyone who believes that government employees act through knightly motives favors a system where the government provides essential services such as education, health care, mail delivery, and housing. A person who believes that government employees are as likely as any businessman to be personally selfish would prefer a more market-driven approach, in which customers were given government money to purchase the services they desired and vendors go out of business if they didn't get enough customers. Opinion about beneficiaries is nearly as important. Teachers' unions argue that parents can't determine the best school for their children and should be forced to send their kids to government-specified schools. Those who advocate school vouchers, on the other hand, have confidence in parents' ability to identify and avoid failing school systems which would go broke as students fled. Are the people who provide the service knights or knaves? Are recipients passive pawns or active queens? Pawns don't do things, they have things done to them or for them. Queens take action on their own behalf. Most questions about pubic spending and about taxation, for that matter, are different ways of expressing these two seminal questions. It doesn't matter what people really do, what matters is how the legislators who set up the programs think people behave. The notion that welfare recipients are passive pawns who're content with whatever they get seems more and more quaint, particularly in the light of the London riots. Far from being content, rioters smashed shops and helped themselves. It's hard to judge motives through a TV screen, but the general attitude seems to be a sense of entitlement - looters believe that they deserve whatever they can grab. Much of the book expands on these fundamental concepts by describing situations which came up in English public policy. One of the more interesting case studies deals with the Irwell Valley housing association which provides 6,300 homes in the Greater Manchester area. Prior to 1998, the association had all the problems which are typical of public housing - drug-dealing, abandonment, and high turnover. About 80% of the authority's resources were spent on 20% of the tenants. In 1998, the Association introduced a "Gold Service" program which gave tenants priority when scheduling repairs, discounts at local stores, and other benefits. Tenants had to stay current in rent and had to avoid breaching their tenancy contract. They received a cash bonus at the end of the year. They could act like knaves and keep it, or they could be knightly and give it to the tenant's association. If they did that, the authority would match their gift. This made more money available for community-selected projects. It treated the tenants as active participants who made choices. This let them grow from being pawns toward being queens. Empowering the tenants had good results. Turnover dropped, people stayed current in their rent, and there were fewer maintenance requests. Yes, the bonuses cost the authority money, but more was saved through lower maintenance and less need to chase delinquent renters. For what it's worth, the tenants were happier too. The many examples in the book show that it's perfectly possible to use markets to increase the efficiency of providing government services, assuming that politicians actually desire efficiency. Unfortunately, introducing market-like efficiencies gives people choices, and giving people the ability to choose reduces government power. To a control freak, no increase in efficiency justifies a reduction in control. Obamacare is all about knightly government employees providing medical services to pawns who take whatever they're offered and vote for Democrats out of gratitude. Is that a realistic view, or a recipe for discontent? Knaves will be knaves, Queens will be queens, etc. because it is in their best interest, human nature almost always prevails. How do you stop the looting of the treasury? In wartime as Britain experienced in WWII it was about survival and most people knew it and acted accordingly. When the threat of extinction passed so did the nobler actions of people end. I was at a business meeting today and the subject of how we got into the mess that we are in came up. I made the point that it wasn't the politicians who were to blame entirely, but we ourselves, the voters. One of my partners, who is liberal said,"It's really the big corporations that buy the votes that put them into office with their money." I thought about it for awhile and have to say that he was very much on point. They, the corporations, are just as much of a knave as the people in the streets in London. I had read Offensicht's article prior to our meeting so it was in the back of my mind. My partner's statement really made me realize what a scary problem that we have today. Between the large corporations(elite moochers) and the moochers I don't know if this aircraft carrier can be turned around. Who really wants to change things? Not them and the rest of America to a large degree is somewhat on the dole. I have preached pure capitalism as the way out and still believe that but without reform at the top and the bottom there is no secular solution.